A beautiful present to start off your week. The contents of this gift inspired its rugged packaging. Read about it here. 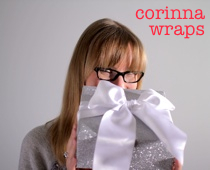 A whole blog on gift wrapping…wow! I feel like a kid in a candy shop:-) You blog’s lovely. I love gifting and think gift wrapping is like the icing on the cake…makes the gift so much more alluring.